Too often we report the passing of good people who are universally well liked, with attributes everyone would hope for in a husband, father, grandfather, friend and workmate. We were saddened to learn from Keith Spice and Kevin Campbell that following a 12 month illness, former TVW Channel Seven Supply Officer Ross Mathews died aged 67. “He was a good bloke Ross, always had a smile and a friendly g’day for everyone. Before joining TVW in 1977, Ross was operating a fuel agency and shop on Yanchep Beach Road. A route which now provides access to the outermost northern coastal suburbs of Yanchep and Two Rocks, from Wanneroo Road. 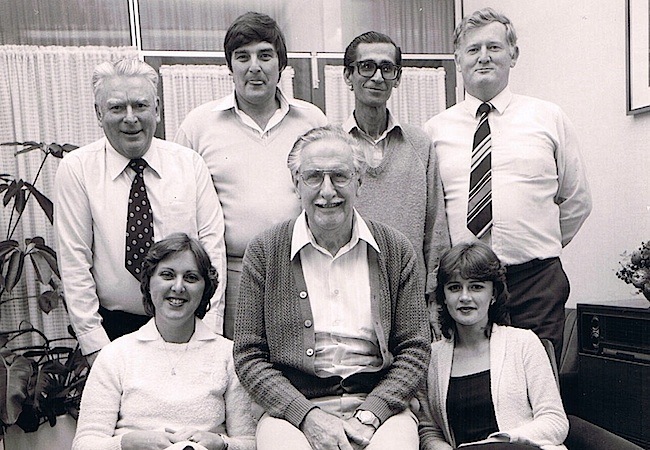 Ross loved working for TVW when he joined Ken Kemp, Ron Long, Ivan Lewis, David Dallimore, Roslyn MacIntosh and Vickie McDonald in the supply department. Not only was the department responsible for purchasing and replenishment of vital supplies, but the section was also pivotal to the success of various special events from family fun days to Telethon. In 1972, The first ever Swap Meet for Telethon took place at Cannington Oval, to be followed monthly at venues such as Midland Oval, Claremont Showgrounds and the Fremantle Myer’s car park. The Swap Meet notion came from a ‘Time Magazine’ article about California, that was sighted by Ken Kemp, who then encouraged TVW management of the virtues these events have on fund raising. The Lions Club of South Perth became involved through a Lion’s member and showman named George Stewart, who was great help as a provider of rides for the popular ‘Hole-in-One’ golf days at TVW. On joining TVW in 1977, Ross Mathews began a twenty year involvement in Swap Meets and Telethon money raising events. Ross was a considerable help with these ventures, until taking over from Ken Kemp, following his retirement in 1983. Prior to this, Alan Shaw helped Ken in these matters. Ross stayed with Seven until the highly successful Western Australian broadcaster lost its autonomy following the many ownership changes and the restructuring of the Seven Network. This resulted in not only a scaling back of local production but a shrinking of the local workforce. Ross left Seven in 1997 to establish himself in the earthmoving field with four trucks, undertaking such projects as the transport of vital materials for the new Bunbury highway. Many will hold fond memories of their time working with Ross. A popular gentleman of fine humour who will be sadly missed. Ross passed away at St John of God, Subiaco, after a 12 month battle against lung cancer, which oddly was for a man who never smoked. Ross is survived by his loving wife Kerry, their sons Gerry, Craig and Brett. Daughter-in-law Dian and granddaughters Madeline, Amelia and Helena. Passed away at St John of God Subiaco after a 12 month battle aged 67. A battle which he fought hard until the end. Beloved husband of Kerry, loving father to Gerry, Craig and Brett. Father-in-law of Dian and wonderful Grandpa to Madeline, Amelia and Helena. Special thanks to Dr Tom Van Hagen, Kath, Dr Eng and Dr De Felice for their wonderful care and support. Dear Ross, happy memories of the good times we shared. We had wonderful times with our 3 sons, grandchildren, family and friends. We were lucky enough to have had beautiful holidays together. The happy memories of the good times I will hold in my heart forever. Rest in Peace Ross, love always Kerry. Dad, words cannot express how I feel today. I have the greatest memories of our time together. I love you very much. Rest in Peace, Dad. Love always Gerry. You have always been the greatest Dad. Words can’t describe how proud I am of you. Your battle is over, you can finally rest in peace. Love always, Craig. Dad, Grandpa you will be missed but we have so many loving memories that will stay in our hearts forever. In your own words “trust me”. In memory of our dear friend Ross, we’ve had many years of football, holidays, outings and get togethers. You will be sadly missed at these gatherings as we raise a glass to our friend. 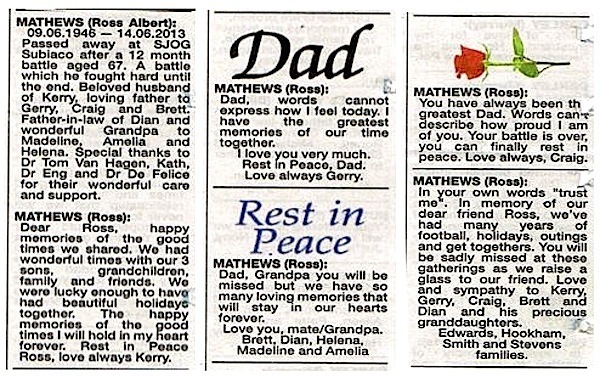 Love and sympathy to Kerry, Gerry, Craig, Brett and Dian and his precious granddaughters. Edwards, Hookham, Smith and Stevens families. Deepest sympathy to Kerry, Megsy, Gerry and Brett and family on the loss of the best footy coach a kid could have. Thankyou Roscoe for the priceless memories and all the laughs, the good old days at Subi oval and a ride home with Albert. Out of pain and at peace, you’ll be sadly missed mate. Nathan, Aimee and Tommy Langlands. Farewell to a wonderful brother, a wonderful brother-in-law, and above all a wonderful mate and friend. Condolences to Kerry, Gerry, Craig, Brett, Diane and grandchildren. Les and Pam Mathews. Our deepest sympathy to Kerry and family in the very sad loss of Ross. Our deepest sympathy to our dear friends Kerry, Gerry, Craig, Brett and family on the loss of a great man. Our thoughts are with you at this very difficult time. Love Sheree, Troy and Trudy, Lana and Mark. Deepest sympathy to Kerry, Gerry, Craig, Brett, Dian, Helena, Madeline and Amelia. Our thoughts are with with you. Love the Neeson family. Deepest Sympathy to Kerry and Boys. Deepest sympathy to Kerry, Gerry, Craig, Brett and family on the passing of Ross. Such a great bloke and taken way too early. Pottinger family. Sixty years of wonderful memories of our dear friend Ross. Especially the picnics, bbq’s sport events, holidays, jokes and laughter. Our love and sympathy to Kerry, Gerry, Craig, Brett and family. 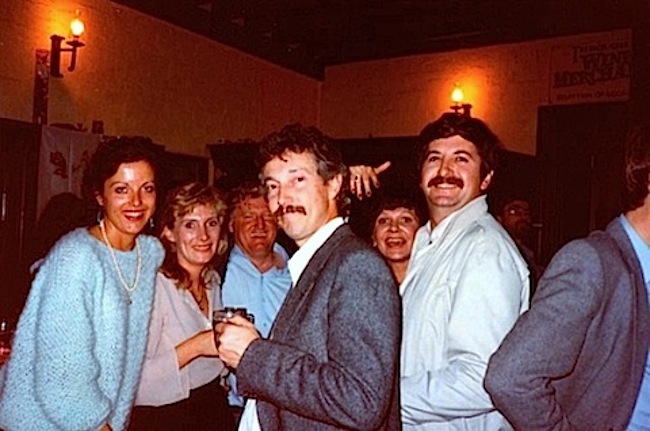 Terry, Shirley, Daniel, Tracey, Peter and girls. Fond memories of happy childhoods spent together. We extend our sympathy to all the family. Our thoughts are with Kerry and family. With much love and respect, Syd and Josi Standring. Happy memories of our time working together. Deepest sympathy to Kerry and family. Our thoughts are with you. Mick, Beau and families. A great mate to both of us. Sympathy to Kerry, Gerry, Craig and Brett. Our sincere condolences to Kerry and family on the passing of Ross. Our thoughts are with you at this sad time. Keith and Val Sloan and family. Farewell Ross, we have great memories of junior football, indoor cricket, Eagles (the A team) and many social outings over 30 years. 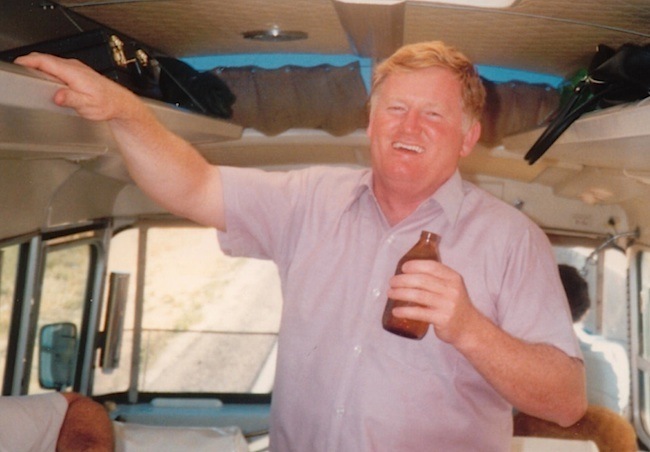 Your sense of humour, jokes and larrikin behaviour will be sadly missed. Our love and deepest sympathy to Kerry, Gerry, Craig, Brett, Dian and family. Love from Sandra, Kerry and family. Ross, you were the consummate family man. Your family were always your first priority. You gave endlessly to them with your love and generosity! Our hearts break for your loss Kerry. Deepest sympathy to you and Gerry, Craig, Brett and Dian and your beautiful granddaughters. Love Steven, Lian, Samantha and Amy Gates. Great National Service Mate of Gerry Keating. Our friendship is unique. Kilometres separated us but the bond is unbreakable. The greatest Mate a man could ever have. Love ya Mate. Love to Kerry, Gerry, Craig, Brett and family. Gerry and Marg Keating and family. Wonderful memories of a lovely man and good friend. Ross will be greatly missed. Deepest sympathy and much love to Kerry, Gerry, Craig, Brett and Dian and family. Our deepest sympathies to Kerry, Gerry, Craig, Brett and family on your sad loss of Ross. Love and sympathy to Kerry, Gerry, Craig, Brett and family at this very sad time. Great memories of very good times. Rest in peace Ross. Sincere sympathies to Kerry and family. Fond memories of Ross and of many happy times spent together. Ron and Anne Newell and family. MATHEWS (Ross): Uncle Ross, we will miss your sense of humour, the good times we shared and the laughs. Go the Eagles! Rest in peace, love Paul, Nat, Tom, Ben Mathews. Deepest sympathy to Kerry, Gerry, Craig, Brett and family on your sad loss of Ross. Laurie and Nola. Rest in peace Ross. MATHEWS (Ross ): To a great brother and friend. You tried so hard to stay with us. The tears we can wipe away, but the memories of you will forever stay. Love and support to Kerry and boys. Love always from Kay, Vern and family. Deepest sympathy to the Mathews family. Well done swap meet Ross. The Lions Club of South Perth. Deepest sympathy to Kerry and family. Ross will be truly missed. Simply one of the best. Ross will be sadly missed by all of us. We are away at present but this doesn’t stop us all remembering the great times gone by. We send our love and condolences to Kerry and all the families. Our thoughts with you at this time. Love Hendo, Joyce, Susan and family. The Funeral Cortege for the late Mr Ross Mathews of Subiaco, formerly of Wanneroo, arrived at the main entrance of KARRAKATTA Cemetery on THURSDAY (20.6.2013) for a Cremation Service that commenced at 12.30pm. A very large number of family, friends and workmates were present, to the extent that the funeral director ran out of cards, which unfortunately makes it difficult for the family to respond to all who kindly attended..